At the very core of the Craig McMurdo experience is the ultimate in music for dancing, The Craig McMurdo Dance Orchestra, which has a remarkably extensive and versatile repertoire that spans the '40s, '50s, '60s & '70s to the present day. 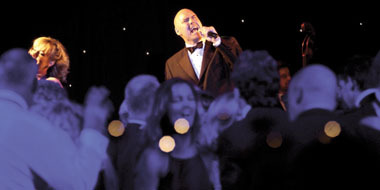 Sets are packed with instantly recognisable hit after hit from Sinatra to Van Morrison, The Drifters to The Commitments, Abba to Al Green, Bacharach to The Blues Brothers, Presley to the Pop Idols, ensuring the dance floor is always full. Sophisticated jazz can be provided as background music during a meal or drinks reception by the classic instrumental jazz trio line up of piano, bass & drums. In general, clients can choose between 1 x 90 min, 2 x 60 min or 3 x 45 min sets for dancing, it entirely depends on the structure of the schedule. The band try to be as flexible and accommodating as possible to ensure the event is a success. 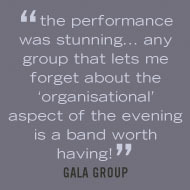 Visually as well as audibly impressive this talented show band features seven world class musicians and three amazing female vocalists in a high energy, highly choreographed performance led by the enormously charismatic Craig McMurdo. For the latest information please visit our new website, solely dedicated to The Craig McMurdo Dance Orchestra, www.londonfunctionband.com, for more videos, music and photos. Click here to request a copy of our brochure or visit our new site, solely dedicated to The Craig McMurdo Dance Orchestra, www.londonfunctionband.com, which includes the MP3s of the full demo with 35 tracks and samples of 102 songs.